Elian and his dawn dragon, Aurora, lead the search for the fourth and final orb. Pursued by night dragons and helped by a WWI airman, the four dragonriders are drawn into a huge aerial battle between all the dragon enclaves. The ultimate fate of dragonkind hangs by a thread and a terrible price must be paid. Well-plotted story featuring four dragonriders who need to find the fourth and final orb in order to succeed in their mission to save the world. This is the fourth and final in a terrifically exciting series. Full of adventure and action, Aurora is exciting to read and the finale is especially dramatic. 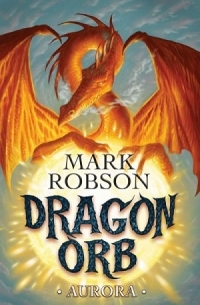 Mark Robson is a former fighter pilot turned writer... he employs his experience of daredevil flying antics to create some awesome aerial dragon battles. This is inventive and beautifully executed.